According to the public story around, Tabuhan cave has found by Kyai Santiko who lost his ox but finnaly the ox was come to a cave. His ox didn't want to out from the cave, because it save many water from the root on it. After the brushwood has cleaned, the cave was taken care by Raden Bagus Joko Lelono and a princess Raden Ayu Mardilah. 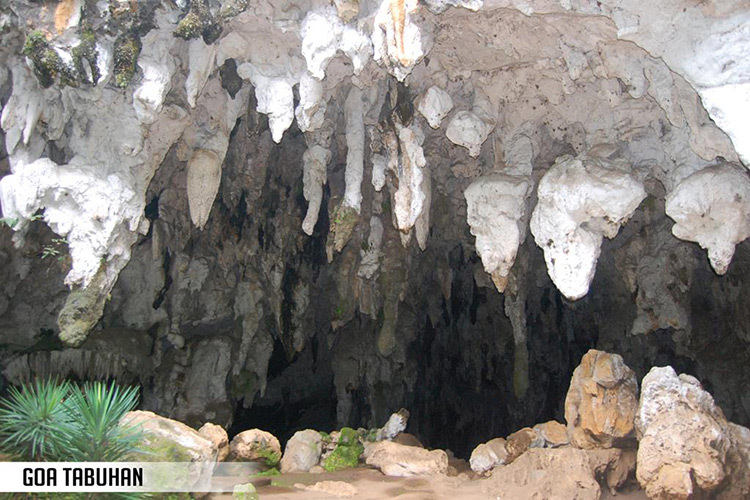 Tabuhan Cave is on the southwest coast East Java, is the emmense interior of Tabuhan cave. This cave called Tabuhan because it sounds like local musicians play tunes by striking lomesone stalactites that resound in perfect pitch to the music. The cave it self is spectacular, its varilored stalagmites reaching upwards as high as 50 meters toward pendant stalagtites formed by water dripping from the roof. It is called as Tabuhan cave because if lapped will yield sound like rhythm of Javanese music (gamelan). Tabuhan cave is initialy known as Tapan cave because since ahead applied by the chevaliers for some meditation like; Sanggargenu, Bambang Trigo. Wareng village is recognized caused the legend of Banteng Wareng which is descendant of Sultan Yogyakarta. It is told also in 1825 happened war Diponegoro, Raden Banteng Wareng show his patriotic soul opposed the colonized with Diponegoro. This cave is located in Wareng village, Punung district about 40 km from Pacitan city towards west. The facility like Musholla and souvenir shops (Multifarious stone products /Akik).